I made a batch of Chex Mix yesterday, and I can never make it again. The temptation is too much for me to bear. I cannot resist stopping by the pantry for a handful each time I walk into the kitchen, so please allow me to post this recipe and then hide it forever. Store bought Chex mix is not gluten-free, but it is also not as good as homemade. I used the recipe from the Pioneer Woman, which adds in fresh garlic and a little Tabasco, making sure to use only Corn Chex and Rice Chex and gluten-free pretzels. Here’s the link to the recipe on thepioneerwoman.com. Dump cereal into a large mixing bowl. Add in pretzel sticks and nuts. In a microwave-safe bowl, add remaining ingredients and microwave until butter is melted. Stir together and toss into a cereal mixture, stirring as you go. Transfer mix onto one or two baking sheets, and bake in a 250-degree oven for 1 hour and 15 minutes, stirring every 15 minutes. Let cool and store in an airtight container. Grab a handful every forty minutes. Eat. Spoil your appetite. I just read the ingredients and I can smell the mix cooking already! No wonder you can’t help yourself! I’m gonna have to try this! 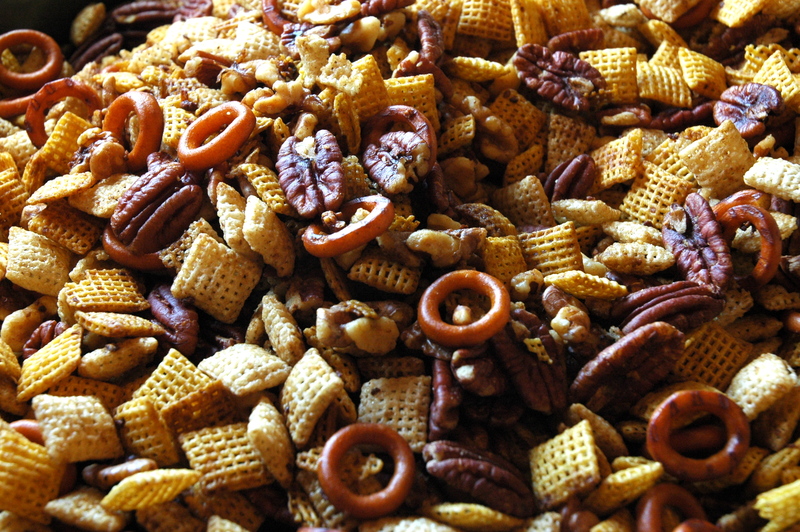 I love chex mix…. and have made it GF before – but had never thought of adding tabasco or fresh garlic (duh!). Can’t wait to try that! And just gotta say – I LOVE your addition at the end…. made me chuckle out loud!